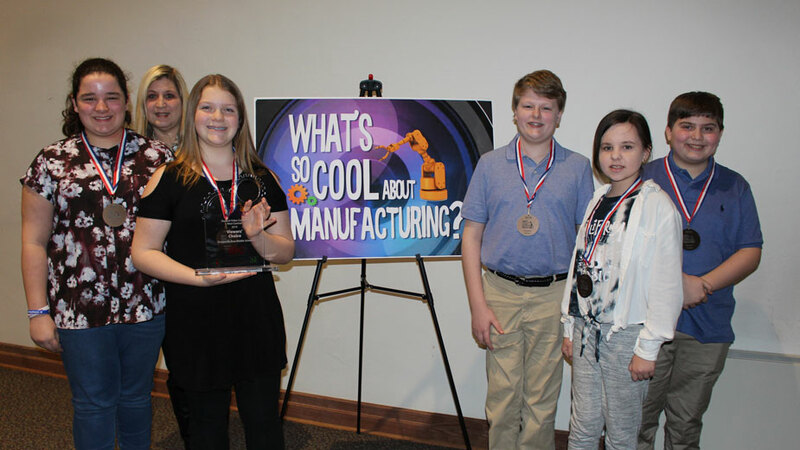 Mia Aley, Lisa Oliver-Lapikas, Carmen Alfredo, Nick Bell, Ericka Grandy, Nolan Lapikas, JoLee Lundquest, Jlia McConahy and Conner Rogers from Sharpsville Area Middle School were the winning team in the What’s So Cool About Manufacturing? video contest. SHARON, Pa. – For the team from Greenville Junior/Senior High School, the hardest part of telling the story of Ilsco Extrusions Inc., was sorting through the abundance of interesting information. “We had a half-hour worth of interviews that we then had to cut down to 2 1/2 minutes,” said Matt Gehly, a teacher at Greenville and the team’s coach. Greenville was one of nine schools from western Pennsylvania to take part in this year’s What’s So Cool About Manufacturing? video contest. Each school was paired with a local manufacturer and tasked with making a video about who they are and what they do. The students began working on their projects in October. The videos were then posted online so the public could view them and vote for their favorite, with a total of 14,980 votes cast. 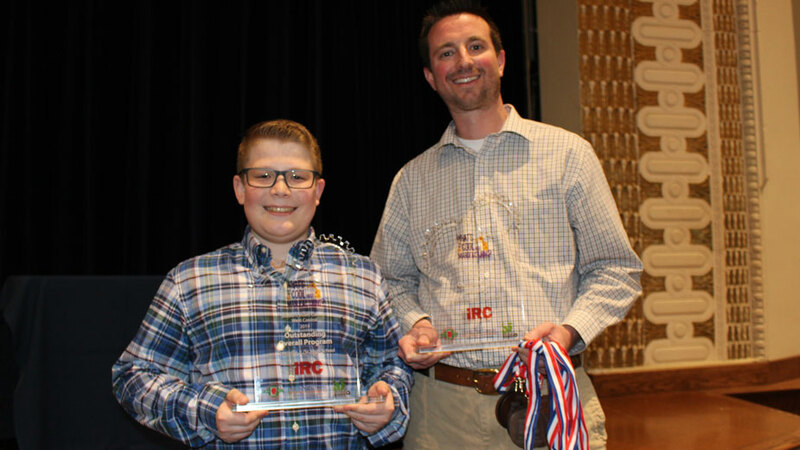 The team from Sharpsville Area Middle School won the Viewers’ Choice award with 3,494 votes with their video on Reynolds Services Inc. of Greenville. Their video, along with the other entries, can be watched here. The team spent a lot of time on marketing, said team member Julia McConahy. The students and manufacturers were honored for their hard work at an awards gala Thursday night at Penn State Shenango. Bob Zaruta, president and CEO of the Northwest Pennsylvania Resource Center, which directed the program, said the goal is to increase awareness of opportunities in manufacturing, not just for students, but also for their parents and the broader community. Rylan Walberg and Matt Gehly from Greenville Junior/Senior High School, which won the awards for Outstanding Editing and Overall Program. And, he said, those opportunities are even better in the northwest region of the state. This year’s What’s So Cool About Manufacturing? program held 15 such competitions across Pennsylvania with 250 school/manufacturer teams. This is the programs second year in the west-central district, and it’s sixth year overall. Part of making that change is getting people to understand that the environment in a manufacturing plant today is much different than it once was. Entering the manufacturing industry is also much cheaper than what one would pay for a typical college degree said Scott Covert, an instructor with Penn United Technologies, a manufacturing solutions provider based in Cabot, Pa.
“A lot of companies now are offering tuition reimbursement. We want you to be educated. We’re going to pay you to go back to school,” he said. Covert also told the audience that manufacturing is “cool,” and “encompasses almost everything in our lives,” and you don’t have to go far to see it. As an example, he asked the audience if they noticed the American Flags on the back of Team USA’s jackets at the Winter Olympics. “You know what that flag actually was? It was a heater. There’s a company in Butler County called Butler Technology that used printable circuitry to make those jackets,” he said. The same company is also making K Cups for Keurig coffee machines with medicine in them so people who can’t take pills can take their meds with their coffee. “These are the cool things that are happening in western Pennsylvania,” he said. Greenville Junior/Senior High School and Ilsco Extrusions in Greenville. Hickory High School and Wheatland Tube Co. in Wheatland. Jamestown Area Junior/Senior High School and Jamestown Coating Technologies in Jamestown. Lakeview Middle School, Stoneboro, and Penn Stainless Products Inc. in Jackson Center. Mercer Area Middle/High School and Miller Industries in Hermitage. Sharon Middle School and Sharon Tube Co. in Wheatland. Sharpsville Area Middle School and Reynolds Services Inc., Greenville. West Middlesex Junior/Senior High School and Solar Atmospheres in Hermitage. Laurel Middle School and Wendell August Forge in Grove City. In addition to the Viewers’ Choice, five other awards were given. Greenville Junior/Senior High School won the awards for Outstanding Editing and Overall Program. Laurel Middle School received the award for Outstanding Creativity. The Outstanding Cool award went to Mercer Area Middle/High School. Pictured: Mia Aley, Lisa Oliver-Lapikas, Carmen Alfredo, Nick Bell, Ericka Grandy, Nolan Lapikas, JoLee Lundquest, Jlia McConahy and Conner Rogers from Sharpsville Area Middle School were the winning team in the What’s So Cool About Manufacturing? video contest.